Aussie Escape Caravans new facility at Brendale North Brisbane really is Caravan Heaven. The business is family owned and operated and employs 15 staff including 7 tradesmen in the Caravan workshop. 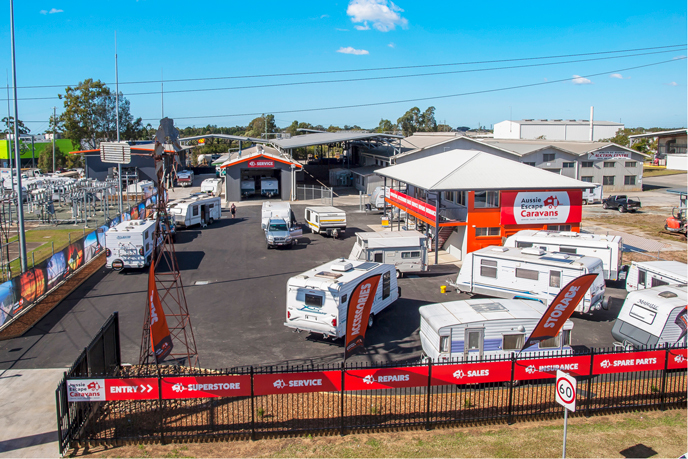 Over the past 15 years Aussie Escape Caravans has grown steadily and the relocation to 40 South Pine Road Brendale in May 2016 saw the business expand to include a Caravan Superstore, Caravan Sales Yard, Caravan Storage and a new workshop. Aussie Escape recently launched its on-line store with hundreds of caravan accessories and parts. Andrew Bruce opened the doors to Aussie Escape Caravans in July 2005. A Brisbane local Andrew is a family man with 2 children and a passion for providing the best service and support to customers. With over 20 years’ experience, Andrew started working in the caravan industry when he was just 18 years of age. He undertook a 4 year apprenticeship as an Automotive Engineer and in 2001 Andrew was honoured to receive the Inaugural Young Achiever of the Year Award, Judges Special Commendation presented by Caravan Trade & Industries Association (CTIA) of QLD. Over the years Andrew has quoted and carried out all types of repairs, services and modifications to all brands of caravans, campers, trailers and motor homes, from complete renovations to minor repairs. Andrew loves to work closely with customers and has come to realize how passionate his customers are about their pride and joy. There are always great travel stories to be heard, and many photos of our beautiful country to be seen. “Being a family business with a passion for the industry, our reputation is important; and we strive to uphold our quality workmanship and genuine service. "Travelling the country alongside you mate? with a guarantee of our high quality standard and workmanship. in your caravan, motorhome or camper trailer. we certainly strive to excel.